Leading is a lot more to do with accepting and giving help than we often realise. Many of us carry in our heads an image of how leaders should behave that is at odds with how people actually influence us (aka lead us). Our model for leadership is rooted in a presumption that they should have specific expertise and knowledge that followers do not possess – a sort of unique secret sauce! After all – this is how they became a leader and hence why they should not need help, isn’t it? Yet even a cursory amount of thought should challenge our assumptions – not least if you look at the way we all resist ‘leadership’ provided from this perspective. Most leaders will readily admit that in many situations in their organisation they do not have the best expertise to solve an issue. Even in knowledge-based organisations the leaders are rarely those with the most knowledge or insight. Yet we persist in our assumptions – and the result is that leaders come to their roles often with same assumption. Somehow being helped and being a leader does not sit comfortably. But those leaders who learn how to receive (and give) help well will perform much more effectively. The most successful form of influence is that which is perceived as help by those being led: where the follower is a kind of ‘client’ who is assisted to achieve their goals. This is even true when mandatory change is needed. Atul Gawande in his book ‘Better’ recounts the case of persuading medical staff to wash their hands more frequently to improve hospital hygiene. A clear policy with carrots and sticks achieved at best perfunctory compliance despite the essential nature of the change. It was not until doctors (leaders in the hospital but followers in this change) were really asked why hand-washing was problematic that a combination of approaches created success – including more and more convenient washing points and using gels that reduced the time taken to cleanse hands. In effect the goal was reached when doctors were helped to achieve the goal and not before. In all organisations leaders need to lead leaders – hence why many would say that the best leaders are also those who know how to follow well. 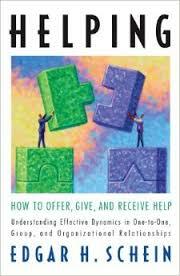 I have always been very interested in the dynamics of giving and receiving help. It is at the heart of effective consulting and at the centre of the sort of teamwork that makes or breaks the resolution of most marketing, strategy or organisational issues. Effective teams, by their very nature, demand fluid giving and receiving of help. So with the benefit of a recent break and ample time to catch up on reading I was able to read a book on the topic, by one of my favourite academics on leadership and culture, Edgar Schein. ‘Helping’ builds on much of what he has previously written on process consulting but has a more general focus and therefore is even more accessible. The book duplicates some of what he has written elsewhere but is nonetheless a perceptive and useful analysis that highlights some valuable principles and tips and when I read, “….leaders must first learn to accept help themselves….and must become helpers to the organisation they are trying to influence,” it seemed worth a blog post. Schein points out that asking for help has a psychological impact on us. It generates anxiety, as we expose our vulnerability. In effect it places us ‘one step down’ from our potential helper – in a position of dependency. This shapes the initial dynamics of any discussion. Unless handled well by the helper it can lead to a very unproductive interaction. Think of – calls to helplines, advice from a sales assistant, or a favour asked from a friend. 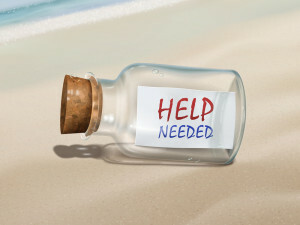 Recall how many times you have found the ‘help’ to be less than helpful – things that you’ve tried before, a simplistic answer to an issue, or irritating or downright patronising. These are traps that are easy for helpers to fall into and Schein is adept at explaining why. Such experiences and this anxiety probably account for our reticence in seeking help. Yet if, as leaders we understand and can effectively coach others to help us effectively, we can start to improve our own giving of help – and hence our influence. Such skills are vital if success demands as a precondition that each party is ready to give or receive help, as in the hospital example above. How readily we picture in our minds eye a helper as either an expert who can provide a specific service or piece of knowledge (think engineer or teacher) or as a doctor who should diagnose the issue and make informed recommendations. Neither of these mental pictures are the most useful ones to start off with let alone for addressing the complex organisational issues that leaders typically handle. A much more effective starting model is the ‘process consultant’. The move to one of the others should only be consciously adopted once we are sure that it suits the situation. The reminder that effective help takes place only when both parties are ready to give and receive help and not before. This is an emotional readiness. Getting to this starting position needs both relationship and task issues to be addressed first. The value that this ‘process consultant’ mindset provides in making a helping interaction effective: the focus on accurate understanding of the issue; equalising the power balance between helper and helped; and creating the conditions to explore problems together. It is a powerful mix. The need to start any helping interaction with what Schein calls ‘pure inquiry’ which means that the helper needs to start with as few assumptions as possible and ‘access their ignorance’. This helps to redress the power imbalance that exists at the start of the discussion and ensures effective communication of what the problem is and what shape it has. It empowers the ‘client’ to retain ownership of the problem and play fully their role in its resolution. The immense value of asking for feedback on what is and is not helpful – especially early on but also periodically. This is the best way to check that the helping model we are using is the most useful one for the person being helped and that what we doing is working. The book is a great reminder of some basics for effective influence and for offering real value in any role. It reminded me of the need to recognise my own attitude (and reluctance) to being helped and to use the insights that can be gained from this to make sure that I approach leading and securing commitment not just with the right attitude but also with the right tools and skills to unlock a positive impact. Maybe when I am next lost, I will not so readily wait for access to Google maps rather than asking someone who may have local knowledge…? The Economist this week featured an interesting article in its Schumpeter column on the often hidden problems of the emphasis on collaboration throughout business and its impact on productivity, creativity and original thought. As a fan of collaboration in general, I was pleased and amused to read a lovely summary of the downsides it creates when it receives unthinking endorsement and emphasis. It captures very well the potential issues that it creates and the tendency to see the benefits but fail to read the costs. It highlights our inability to really multitask (something that I have always noticed when walking behind someone on their mobile phone in the London streets! 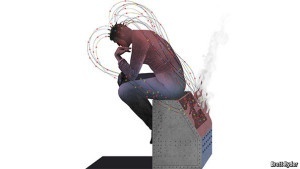 ), the already well-understood costs of disruption and the mental set-up/set-down time that serious concentration exacts. All of which make collaboration great…up to a point. A great short poke at over-emphasis on one feature at the expense of others! 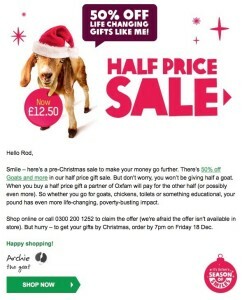 Just before Christmas I opened my inbox and was disturbed to see this intriguing offer from Oxfam. It was part of a drive to boost sales of Oxfam gift cards. These are cards that you give to someone to explain that as a present to them you have given a gift to a needy person in the developing world, in this case – a goat. Why did this make me stop and think (and then decide to blog about it)? …because I felt that it broke a cardinal aspect of good marketing: all brand messages should always act in accordance with their proposition. Emotionally this offer clashed with my understanding of the proposition – the reasons that I had bought the cards before. If I am giving a gift to someone that is simply a gift to a third person why would I want to halve the cost of the gift so that I save money? It undermines the value of the gift to me which is the gift to the charity. How does this help the person for whom the gift is intended. Surely a goat costs an amount of money and half that amount therefore only buys half a goat…so it is worth only half as much as a whole one?! How does this help Oxfam? If I want to buy goats for people at Christmas and they halve the cost of a goat, then, as I do not have more people to whom I want to give goats, surely the offer simply raises half as much money. Even when I read the details more closely and realised that they had another donor who would pay for the ‘other half’ of the goat I was still suffering a real sense that this was a breach of the whole idea of giving a gift that is a donation to a third party. I felt that it was something that diluted the value not strengthened the value of the brand. Yes – it may encourage new buyers but then I was emailed and I am not a ‘new buyer’. Hence this blog post: In a world of competing voices and hyper-competitive categories, diluting your proposition is to inflict wounds on your brand or idea and should be avoided at all costs. The key to doing this well is to put more effort into crafting your proposition. The proposition is a fundamental strategic tool, the bedrock of marketing, and a touchstone for decisions on commercial policy and actions. The clearer and the stronger that it is then the better for the organisation, brand or group that it speaks for. All brands have a proposition but too often people have not put the research or thought needed into it. This often leaves organisations with inconsistent or ineffective ones, or overly complex propositions that cannot be communicated clearly across the organisation (let alone to the outside world!). A great example of the power of real thought and clarity can be seen in P&G’s approach to advertising strategy development. It is a discipline that helps to capture a ‘reason to believe’ in the brand which then anchors every marketing communication for the rest of its life. For new brands, an enormous amount of research and thought goes into creating a sustainable and powerful statement so that all the investment and activity that then supports a brand continually builds equity that lasts as long as possible. The proposition captures the value that the brand brings to the world. It is it’s ‘reason for being’ and for sustaining and cannot, even in this age of personalised marketing, be all things to all people. Brands, or organisations, can offer multiple aspects of value – of relevance to different people, occasions and situations – but these must all be consistent with each other and over time. The energy and analysis that shapes them enables them to sustain and perform well in the face of competition. Of course, a well-constructed proposition is not just of value in a straightforwardly commercial environment. It provides the rationale to the outside world for any brand, group, body or even person. All groups, organisations and people have propositions. We spend a lot of time ‘selling’ in our lives in all sorts of contexts. Daniel Pink reminded us of this in his book, To Sell is Human. Indeed, we all spend an enormous part of our lives selling, mostly in a non-sales environment, trying to persuade our children to do something (or not do something), people to volunteer their help, others to come with us to see this film or artist, go to that restaurant, do this activity, stop irritating us, talk to us etc. Every sale is made because someone ‘bought’ the proposition. All groups, communities, individuals and activities have propositions. So it pays to make sure that, whatever you are responsible for, you have thought through its proposition and that you are clear about what it is. Why should customers buy X … in preference to the alternatives (including doing nothing)? In doing so it can shape a mindset for the business – from customer service excellence at First Direct, or low cost at Aldi, to experience delivery at Apple or sound quality at Bose. The proposition can become a mantra to shape innovation, service delivery, product features and price positioning. I use a framework to structure the areas to look at when thinking about what a proposition should be. This helps to frame the questions to be asked and the analysis to be undertaken in a way that helps organisations to create something that is an effective base. It is a honeycomb structure that pulls together 7 key elements for the task. 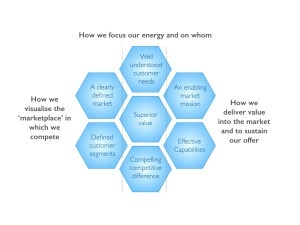 This framework helps to produce a proposition that is strong, relevant and sustainable. If you want to read more about this it is available on slideshare. The Guardian had an interesting feature today on authenticity in politics written by David Shariatmadari which examines why the media profiles of politicians like Johnson, Sturgeon, Trump and Corbyn seem to have connected with the public. The word he picks out is authenticity and he pulls out elements of the definition in straight talking and consistent it also reveals however good a foundation it is it is not enough politically to be seen as an ‘effective’ leader. 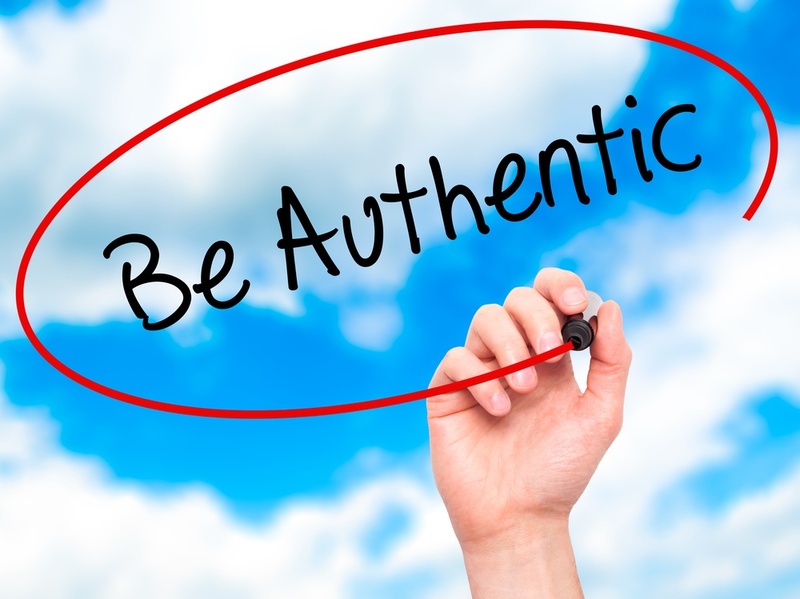 What does being an authentic leader actually mean? If you put their policies on one side for a moment, what do you think of the leadership of Jeremy Corbyn and David Cameron? Who is the better leader? Maybe you consider the answer to be obvious or maybe you think that the question gets to the heart of some of the bigger leadership issues in our society. Leadership has received lots of attention over the years. The focus has moved from one aspect to another over time. Most recently increasing emphasis has been devoted to the character and personal demeanour of the leader as oppose to their situation, behaviour, style or any one of many other points involved in leading effectively. This emphasis seems to chime with the spirit of our times: its lack of trust in institutions and the evident frailties of a social and economic system that has not proved as robust as people thought at the last millennium. Our current Labour and Conservative Party leaders expose some of the tensions created by the demand for authenticity and perhaps help open a window on what this apparently admirable quality might really mean for leaders. This might mean quite a number of different things when applied to a person. Not all are congruent with being an effective leader. Instinctively we might reach for variations on transparency, consistency and vulnerability but there are important problems with these as definitions. Being true to yourself. But exactly what does this mean? Which of our many selves should we be true to? What if we need to change because we are leading a new change or role that has different needs? Behaving in line with what you feel inside i.e. being open and transparent. But, if you are completely transparent in your thoughts and feelings, people may easily lose confidence in you and your credibility as an effective leader. Sticking to your values. But what if things that we valued are no longer helpful and need to change if we are to lead effectively? Back to Dave and Jeremy…who is closest to authenticity? Does authenticity really make the foundation for effective leadership? As is often the case in issues such as this, it is not as simple as some would make out. For instance, there is a tension between people being able to identify with a leader and the authority of the leader. Emotionally I would baulk at being led ‘inauthentically’ but it is not immediately obvious, at least to me, what being authentic means. What therefore must I do -as a leader who is concerned about ‘being authentic’? There are elements of the interpretations above which speak into what it means to be an authentic leader but I think Heminia is right to highlight how grasping at any of these definitions could be counterproductive and undermine the influence of the leader. The core of authenticity is truth. Something is authentic because it is the genuine article and authenticity can only anchor itself around the truth of something. The authentic leader is therefore someone who leads in truth on a consistent and continual basis and it is this that breeds the kind of followership that they generate. Many psychologists when discussing authenticity think in terms of other traits – high esteem, operating in congruence with your core self, embracing vulnerability, listening well, seeing and appreciating others. All in themselves are healthy personal attributes but not what I would use to define authentic. All these might make you feel comfortable but an authentic leader will I am sure sometimes make you feel really uncomfortable and put you under pressure to change your mind or direction. Why? Because authenticity values truth above all else – both external truth (in the reality of the situation or the ‘brutal facts’, as others have described them) and personal truth (an awareness of and unbiasedness of self that leads to saying what you mean and speaking the truth, not lies or half truths, even about yourself). To be like this effectively requires lots of other characteristics that also make for a good leader, e.g. courage, confidence, an ability to marshall the facts and listen effectively, argue through issues, listen and communicate well – but at its heart it is about truth. The essential difference is that authentic leaders anchor themselves on truth and judge their effectiveness and fitness in leading people towards this. Many other things are needed as well as authenticity to lead well but against this definition I would agree that it is a foundation for good leadership. Back to Jeremy and Dave – chalk and cheese, you might say but then I could not possibly comment and anyway I rather like Feta.